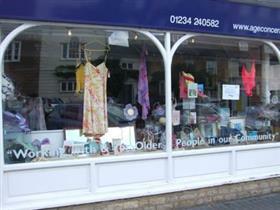 The Age Concern shop in Olney raises money for the charity which supports older people. The shop is staffed by volunteers. Age Concern Milton Keynes operates as an incorporated charity to help all older people make more of life. The charity has been working with people in north Buckinghamshire since June 1978 and for every £1 given to the charity, 90p goes directly towards the work. Special Sunday Opening - first Sunday of the month to coincide with the Farmers' Market.